| What happens when you arrive in the United States? Every day more than a million people pass the custom of the United States. Both American and foreigners must fill out a customs form. In addition, the foreign travelers will also need to fill the I-94 Form. From this form are exempt all foreign travelers who take part of the program travel without visa (ESTA). At the immigration control area travelers will be divided into 2 lanes, one for US citizens, and one for foreign travelers, including the residence card holders, also known as the Green Card. Who arrives here will meet the officials of the Customs and Border Protection (immigration authority) controlling the travel documents; you will need to provide the address of residence / stay, passport, visa and the additional documentation required in some cases as for students and holders of visas k-1. Moreover, Your fingerprints are going to be taken and will be archived along with a traveler photo. 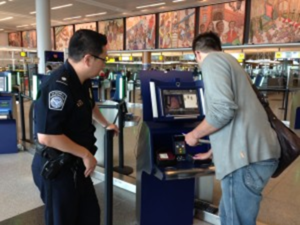 Usually the officials of the CBP take a few minutes to decide whether to give the final authorization at the entrance. Some airports run automated totems for the arrivals of citizens and ESTA holders, where it will be possible to carry out the entry formalities in an automated manner. Who is traveling with a visa will receive the Form I-94 with some important notes to clarify the classification of the traveler and the date up to which it is authorized to remain in the country. It can also happen that the officials of immigration perform some additional controls, so the waiting for the traveler extends. An even deeper control is possible in some cases, and it takes place in a waiting room separated from the area of arrival. Those arriving by sea will undergo the same process, even if this can be done inside the ship. The same goes for those who arrive by land, with some differences regarding American citizens and residents (for which just their passport is needed to enter the country), and the Mexican citizens (for which it is possible to use the Border Crossing Card (BCC) in case they want to restrict their journey to the boundary zone). – Have your passport and travel documents at your fingertips. – Wear shoes easy to take off. – Avoid metal objects that can make the metal detector play. Even children and infants must pass the control areas, but they will not be separated from their parents and / or carers. It is recommended to let children who are already able to walk pass alone through the metal detector. In the case of newborns, the parent/carer can pass through the metal detector with their child. The inspection of luggages will be reserved even for strollers, chairs, bags and diapers. To accelerate the passage of the safety area, you should be ready to take the children from the respective buggies, remain with the child throughout the time provided and do not ask for a third party to keep it, and immediately declare the liquids in your possession for the children. This year Cristina with her husband and his 6 years old son Piero visited Orlando under the program Travel without visa to visit the Disney parks. Once arrived at the Miami Airport, after the usual waiting and once their turn had arrived, the Bianchi’s visited the DYI totem for checking the travel documents and finally enter the country. Although her husband and his son Piero had been immediately authorized, Cristina instead had a result which lead to further controls. In these cases, the traveller is directed toward an additional queue, where an agent of immigration will analyze the travel documents more in detail (passport and Esta in our case). From there, the traveller can be admitted in the country, or as a second option he will be accompanied by the agent towards a separate room from the arrivals area, possibly because there is a problem with the documents / his visit to the country. In Cristina’s case, it was about a case of homonymy with another traveller reported in the system, for which once clarified she could regroup with her family and head to their final destination. In the past year Amber spent a holiday on a cruise with friends which lasted a week. They made a few stops in several cities in the Caribbean, including Fort Lauderdale, Florida. Once arrived in the latter city, Amber with her Esta headed to the immigration controls, at the port, to disembark and enjoy the city. After the routine checks, Amber was stopped for more controls. To the specific question of the online form as to she was never denied an entry to the US, Amber had answered no. On the contrary, the authorities’ data said otherwise. She was denied entry to the US 8 years ago. After confronting with the agents, Amber had the passport printed and was granted entry to the USA, with the promise to declare the accident of eight years earlier in future declarations to the customs authority.